Search committee conducted first-of-its-kind public input process and interviews with qualified pool of candidates from across the country, continues search to fill other leadership positions. ALBUQUERQUE, NM—Today, Mayor Tim Keller announced the results of the search for a permanent Chief to head up the Albuquerque Police Department (APD). A five-member search committee reviewed dozens of applications from experienced candidates from across the country. Interim Police Chief Michael Geier emerged as the top overall candidate to continue tackling crime, reforming the Police Department, and implementing community policing. Based on the high quality of applicants, the administration plans to continue the search for candidates to fill other leadership positions in APD. For the first time, the selection process included public input through seven listening sessions with community members, and an online form on the City of Albuquerque’s website and placed in City community centers. Based on public input, the search was also extended two additional weeks to accommodate a broader pool of applicants. Throughout the process, community members discussed priorities for police leadership with the search committee. 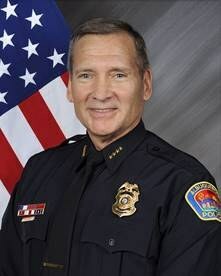 Chief Geier has proven experience in law enforcement, both in and out of Albuquerque. Prior to coming to New Mexico, he served as a police officer for 20 years in the Chicago area. Geier then served 20 years at APD at a number of posts, including the Southeast area command and the Family Advocacy Center, which addresses the needs of victims of domestic violence and sexual assault. In 2014, he was appointed Chief of Police in the City of Rio Rancho. Since Mayor Keller named Geier as Interim Chief at APD in December 2017, he has been leading efforts to strategically fight crime and oversee the most significant organizational reform in APD history. Over the course of his career, a wide range of groups have recognized his outstanding achievements, ranging from the New Mexico Crime Victim’s Reparation Commission to Mothers Against Drunk Driving to the Domestic Violence Resource Center. The appointment will be submitted to City Council for confirmation. The search for candidates to fill other leadership positions in APD is continuing. Mike Geier has served as Interim Chief of Police at the Albuquerque Police Department (APD) since December 2017. Prior to that he served in the position of Chief of Police with the Rio Rancho Police Department for three years, during which time he made numerous progressive changes in the operation of that department. He served on several law enforcement executive committees in New Mexico during his tenure as chief, including the New Mexico Police Chief’s Association, NM Gang Task Force, NM Regional Drug Task Force, the Drug Enforcement Advisory Commission, the FBI’s Regional Forensic Computer Lab and the College of Central New Mexico’s Criminal Justice Advisory Board and Curriculum Committee. Before joining Rio Rancho Police Department, Geier served for 20 years in APD. He served as Commander for nearly five years in APD’s Criminal Investigations Division, overseeing the Violent and Juvenile Crimes Sections. Geier was in charge of several high profile investigations during that assignment such as the Baby Angel case, the Ellen Roth murders and the West Mesa multiple homicides. As the commander in violent crimes, he also served as the director of the city’s Family Advocacy Center (FAC), where he coordinated efforts from several non-profit and governmental providers of victim services in our community. He finished his career in Albuquerque as an Area Commander in the Department’s Field Services Bureau in the Southeast Area Command, one of the most challenging communities within the city of Albuquerque. Geier has received numerous awards and commendations over his 43 plus years in law enforcement. These include the Exceptional Merit Award and a Lifesaving Award (Illinois). He has the unique distinction of being recognized as the Officer of the Year four times during his career with two different police departments. Two of his most significant accomplishments were having RRPD gain recognition by the International Association of Chiefs of Police (IACP) for their Excellence in Victim Services Award in 2016 in the midsize city category (this was the same award he had helped APD achieve back in 2011 in the large city category) and for being awarded that same year with New Mexico State Law Enforcement Accreditation by the New Mexico Municipal League. This was the first time in the history of the Rio Rancho Police Department that they achieved accreditation. Upon his retirement from the Rio Rancho Police Department in 2017, the United States Attorney’s Office gave Geier an award for “appreciation and gratitude for his outstanding efforts which contributed to the attainment of the highest standards of cooperative law enforcement and justice in the District of New Mexico." At APD, Geier received both Officer of the Month in September 1998 and Officer of the Year for that same year with APD. He was recognized by MADD and the Albuquerque Partnership in 2002 for his work in leading APD’s underage drinking program, the Party Patrol. He received another award from MADD for this program as part of their annual Honoring Heroes in 2007. In 2009, he was honored by the New Mexico Crime Victim’s Reparation Commission for his work at the AFAC. The Domestic Violence Resource Center recognized him in 2010 as their Hero of the Year. In 2011, his work at the AFAC was also acknowledged by the International Association of Chiefs of Police (IACP) when APD was awarded the IACP Excellence in Victims Service Award. He received the Public Service Award in 2013 from the Dialogue Institute of the Southwest. A further indication of his work ethic, Geier also finished first on both his promotional processes for sergeant and lieutenant with APD. A second-generation police officer, Michael Geier started his law enforcement career in 1974 with the Wilmette, Illinois Police Department in north suburban Chicago. After graduating from his first police academy at the Illinois Police Training Institute with top honors, he earned an Associate’s Degree in Law Enforcement, a Bachelor’s Degree in Applied Behavioral Science, and a Master’s of Arts Degree in Administration of Criminal Justice. He worked 20 years with that agency, reaching the rank of Lieutenant before taking an early retirement due to his wife’s health issues with winters in the Midwest. Seeking a milder climate, he began a second police career as a recruit officer with the Albuquerque Police Department in 1994, where he started all the way back in the academy. He once again finished with honors as the Top Cadet and Top Physical Fitness student upon completion of an extensive 22 weeks training regimen. He served over 20 years with APD, reaching the rank of Commander in 2007. He is also a 1981 graduate of the 55th class from Northwestern University’s nine month Police Administration Training Program. This was a prestigious police management training program that is now held as a 10-week School of Police Staff and Command. Geier finished with honors in this class of 83 law enforcement executives from across the world. Geier attended the renowned FBI National Academy, graduating with another straight A average. He was selected by his fellow 220 classmates, police executives from all over the world, as Session President and represented their class by giving the commencement speech at their graduation ceremonies in June 2013. He is a published author of police training articles, including a recent research study he co-authored entitled, Albuquerque Police Department Operation Hot Spot Method and Evaluation. It was published in International Association of Law Enforcement Intelligence Analysts journal in 2012. While with APD, he served on the Board of Directors of both the NM Sexual Abuse Nurse Examiners and the NM Crime Victims Reparation Commission. Geier has served in many different assignments during his law enforcement career, working in such capacities as a uniformed field officer, Juvenile Detective, Evidence Technician, Police Instructor, Field Training Officer, the Metro Unit/Anti-Crime Team Sergeant, Gang Detective and Supervisor, Emergency Response Team Lieutenant, Crisis Intervention Team member and Crisis Negotiator and Team Supervisor. He was a member of the first CIT class with APD in 1997. He was also one of the founders and coordinators of APD’s underage drinking program, a successful initiative that gained both state and national recognition. Geier is an avid fitness enthusiast and was recognized for being one of APD’s Most Fit Officers for a total of seven years. He regularly competes in the United States National Police and Fire Championships and the World Police and Fire Games in indoor rowing. He currently holds the national record for the 500 and 2,000 meter races in both the 50-59 and 60-69 age groups. He has also won several gold, silver and bronze medals during international competition at six World Police and Fire Games since 1992. Last summer he won 3 silver and one bronze medal in Los Angeles at the 2017 World Police and Fire Games. Mike has been married to his wife, Judy, for 44 years. They have two adult children and two grandchildren.